What does the newly announced, larger battery storage capacity mean for the consumer in terms of increased resilience? 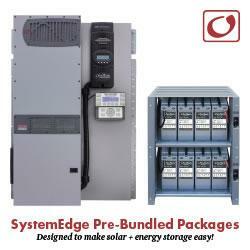 With this upgrade, the Harbor Plus Smart Battery is now the solar industry’s most powerful and efficient smart battery with 17.1-kilowatt hours (kWh) of capacity and power output of up to 10 kilowatts (kW). The battery also now delivers 21 percent more energy and 30 percent more peak power than the next leading home smart-battery solution,1 enabling homeowners to extend solar power longevity, better manage energy around peak-rate periods and withstand off-grid scenarios at a more cost-effective price per kWh of storage. Overall, the smart battery offers homeowners enhanced capabilities to enable more off-grid flexibility. Aside from more power and capacity, what other resilience-oriented features does this battery have and how do they cater to the end user? When it comes to resilience, there are some key features that make the Pika Energy Island a stronger backup solution than any other on the market. Not only can our smart batteries put out more power and store more energy, keeping homeowners powering their homes for longer, but our solutions are actually built to use that power in a more intelligent way. One example is our Priority Backup Mode: unlike many systems, Pika enables homeowners to charge their batteries from the grid in absence of solar power, or as a supplement when an outage is expected. This mode is particularly useful in storm-prone areas. When the power does go out, our intelligent Islanding inverter picks up the load instantaneously, taking as little as 1/60th of a second. Should a homeowner exhaust the market-leading capacity of their Harbor smart battery when no sun is available, they are still protected because the Pika Energy Island has dark-start capability built in. Dark-start Capability is the ability for Pika smart batteries to commission without the grid and restart using only solar power, should the batteries exhaust their reserve energy. Other solar storage systems require on-site service from a technician to jump-start dead batteries, which may delay recovery. What is meant by “Smart” in terms of this battery? Whether for cost-saving self-supply applications like time-of-use scheduling or for rugged backup power, the Harbor smart battery can adapt and power any need. Furthermore, unlike traditional batteries, our smart batteries have the smarts to care for themselves; extending longevity and increasing safety. In the smart battery market, how does the Pika solution compare to offerings from other manufacturers such as LG and Tesla? In addition to superior power, efficiency and capacity, the Harbor Plus Smart Battery offers a number of capabilities that differentiate it from competitive solutions. Homeowners can extend solar power longevity, better manage energy around peak-rate periods and withstand grid outages better with a Pika system than with any other on the market. Specifically, the Harbor Plus offers off-grid, zero-export, time-of-use, and dark start capabilities that the other competitors do not yet offer. Does the newly announced capacity have any impact on a consumer's energy savings? A larger battery means more energy generated on-site by a solar array can be consumed on site, meaning less reliance on grid energy and more cost savings. Customers who have time-of-use rates from their utilities can save even more by programming their systems to charge when energy is cheap and support local loads when grid energy is expensive. How is the ideal solar module and battery capacity determined for a given home? Anybody interested in a solar system for their home will work with a solar installer to determine what their energy needs are and how best to meet them. Factors as wide-ranging as available roof-area, local regulations/incentives, seasonal energy consumption and storm prevalence will weigh in the decision regarding what kind of module to use in a given installation. In a home with little roof space in a very storm-prone area would be best served with a high-efficiency module and a large battery: Efficient panels maximize energy production per-square-foot of roof space and larger batteries help ensure that important circuits stay powered for longer. What potential does this technology hold for the energy grid as a whole? Every day across North America, homeowners are exploring the possibilities of renewable energy from a financial and energy independent standpoint. Smart batteries now allow customers to realize the full potential of their solar systems by making their own clean, solar energy available 24/7, with or without the grid. Customers now have the potential to pay less for energy while taking pressure off the grid during volatile periods by making excess renewable energy capacity available to utilities. In the very near future, these systems will change the landscape of our energy infrastructure. When we connected computers to the internet, our relationship to information was changed forever. Likewise, when we begin to connect smart batteries to our grid, we will create a network of energy that is cleaner, more efficient and more reliable than anything the world has ever seen.